STANDARD's HX238S VHF marine handheld transceiver provides the best performance for everyone from pleasure boaters to commercial fishermen. This rugged and reliable radio provides 55 marine channels and additional 20 expansion channels, 1 or 5 watts power output, scanning, priority scanning, battery saver, LSD read-out and battery life indicator as basic features. 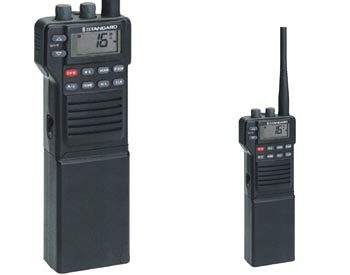 HX238S is a realization of over 20 years proven expertise in the marine communications business. The HX238S measures 163.5 mm(H) x 55 mm(W) x 34 mm(D) and weighs 460 g (with antenna and CNB230E battery pack) and is expertly designed for ease of operation. Extremely small, with optional CNB231E Ni-Cad battery pack, the HX238S measures only 147 mm(H). With over 20 years of experience developing and manufacturing marine radios, and our uncompromising policy, we have refined the HX238S to the ultimate in rugged construction and features that leads the marine industry. A sophisticated design of electronic circuits and shock-proof construction on which you can rely. Surpassing Mil Spec 810D against rain drip and salt fog, this means all weather operation.